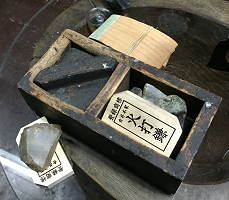 Edo Mingu Kaido offers visitors chances to touch, hold, manipulate and experience old traditional tools. Devices that have moving mechanize, you can understand how they works by actually play around with them. Especailly for children, it would be a good opportunity to play and think. You may try the following tools. In order to light up a lighting appliance, the first thing to do is to kindle fire. 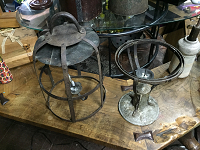 Make sparks with a flint stone and steel onto a carbonized object to glow. Catch a flame using a thin shaved off piece of wood. Kindling fire is not so easy, especially making glowing light or a pilot light which can be affected by the humidity. 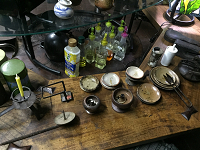 You can light up open saucer oil lamps and open stand lamps. 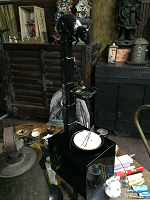 You can light up an andon lantern in a dark room to experience its brightness (or in other word, darkness). You can play with a gando search light in which a candle stays upright in any positions (or angles). 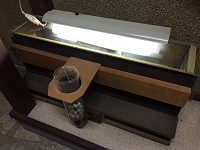 A foldable candle stand invented by Karakuri Giemon would be very enjoyable. 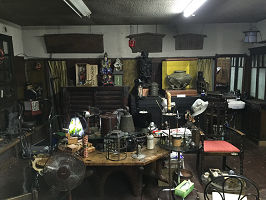 You may observe a gravity lamp called nezumitankei (a rat stand lamp) in which oil is to be supplied automatically through an opening of a rat shaped oil container to fill a saurcer oil lamp placed beneath. You can manipulate mizukumade to catch an object to see how it works. 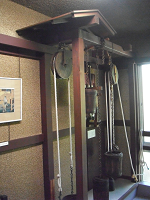 Please try how the old pulleys work. 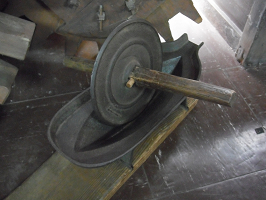 Bellows were used by blacksmiths. 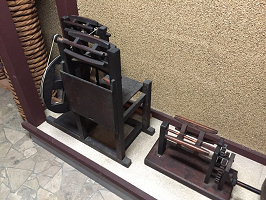 They repeated hammering hot iron and when a blacksmith worked by himself, he used his foot to push and pull a rod of a bellow to blow air to a forge so that he could use his both hands. 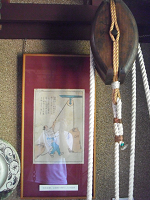 The bellow could blow air with a rod being pushed and pulled in both directions. Please try turning zaguri reels. Please try an antique grinder and feel how it works. Please try a wooden mill. 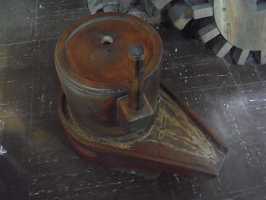 It is lighter than a stone mill though it is quite difficult to turn it around continuously. You can make figures using papier-mache with antique confectionary molds. You can try a handmade toy that flips down the stairs and observe its mechanism. 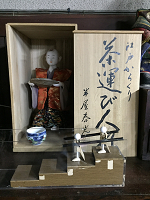 If you desire, Tatsuo Akisawa, a director of the museum, may do the demonstration of a tea serving doll (a replica). 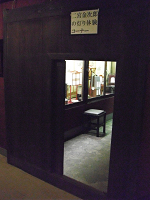 Japanese Folk Art Museum "Edo Mingu Kaido"